Follow this link to the Washington State Referee Committee (WAREFEREES.ORG) site for sanctioned referee training and clinics. See this site for important updates to and interpretations of the Laws of the Game. This information as well as content from "Advice to Referees" is also included in annual re-certification exams. Use this link to goto the USSF site to order additional or replacement badges. What to Do in Case of Thunder & Lightning. From the USSF "Advice to Referees." USSF Advice to Referees 5.11 is your authority. USSF announced by memorandum several years ago that they would follow the then so-called 30-30 rule in determining when to suspend a match for lightning; i.e., when lightning is observed, if the thunderclap is heard in less than 30 seconds then the source is close enough to be a danger and the match should be suspended for at least 30 minutes past the last lightning strike. If you suspend the match and it looks like the storm will pass, you can resume the game. However, if there is another lightning strike, then 30 more minutes! Keep in mind the following for games. Either play shorter halves or cancel the game so the follow-on teams can play on time. Information about registering, referee websites, RMA, finding an assignor, matches, tournaments, training and other important referee stuff. Great resource! Use this link to submit your application for an RMA number. 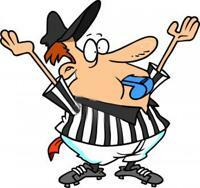 Select 'Referee' for Pierce County Soccer Referees Association. Then, follow the instructions on the site, and you will be able to retrieve your number in a day or two. The Franklin Pierce Soccer Club games are assigned using the PCSRA Website. Richard Wunderle is the FPSC Referee Coordinator and he is your source of information. Need a schedule, have a question, have a complaint, need to know something....get in touch with Rich.